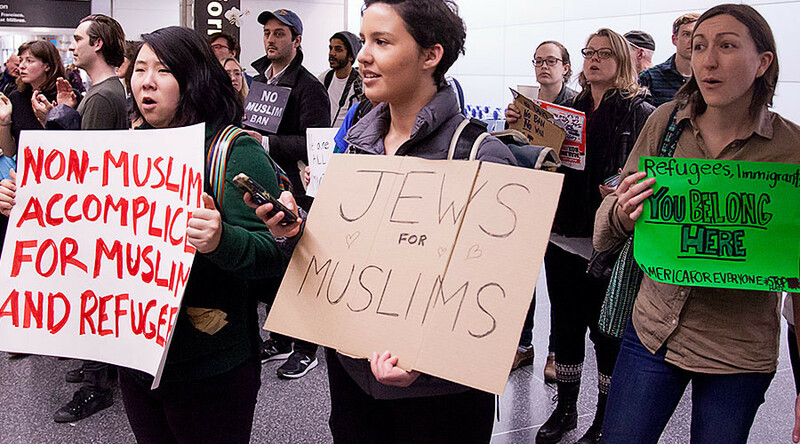 Almost 50 British rabbis have condemned US President Donald Trump’s travel ban as “inciting and legalising hatred” against Muslims just days after the world marked Holocaust Memorial Day. The Jewish leaders called on UK Prime Minister Theresa May to teach her American counterpart “the lessons of history,” when the “tools of state” are directed against minorities. Trump has become the object of protests around the world for signing an executive order over the weekend which indefinitely bans immigration from Syria and temporarily blocks immigration from six other Muslim-majority nations. May has been criticized for failing to condemn the order and for apparently jumping at the opportunity to invite Trump to Britain when she met the president in Washington on Friday. Writing in The Times, the rabbis said: “Last week, Holocaust Memorial Day reminded us what happens when institutionalised hatred goes unchallenged. “This week, we stand alongside our Muslim cousins as they face the consequences — both direct and indirect — of President Trump’s executive order. By effectively banning many Muslims from entering the United States, Donald Trump is inciting and legalising hatred. The letter was signed by 48 Jewish faith leaders, including regular broadcaster Rabbi Laura Janner-Klausner and Rabi Alexandra Wright, the first female senior rabbi in England. In a separate incident, Foreign Secretary Boris Johnson urged MPs to stop comparing Trump to Adolf Hitler, despite the minister himself having compared French President Francois Hollande to a Nazi prison guard just weeks before. “I do find it distasteful to make comparisons between the elected leader of a great democracy and 1930s tyrants,” he said. Earlier this month, Johnson drew criticism for comparing the French president to a World War II German soldier. “If Mr. Hollande wants to administer punishment beatings to anybody who seeks to escape [the EU], in the manner of some World War II movie, I don’t think that is the way forward, and it’s not in the interests of our friends and partners,” the foreign secretary said as quoted by the Independent.